Designed to prevent hyper flashing turn signals due to lower load of LED turn signals. This unit is a resistive load with a built-in thermistor, which retains the resistor's heat while the bike is functioning in emergency flasher mode. Self-canceling "Brain Box" must have the correct draw in order to function properly. Fits all 1991-1999 Harley Davidson models with a self canceling system. On earlier models with the old-style turn signal flasher, change the flasher unit to 381-512, or use the turn signal equalizer. 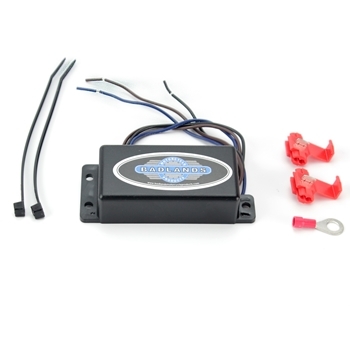 Compatible with all CyronMotor LED turn signals, custom LEDs, and halogens. Wire tabs are included for hardwiring.